Banking stability is an important issue to the proper performing of the whole financial system of any country. The board of directors is the main body of taking decision; therefore we can't deny its role in affecting the bank risk taking. In a recent paper by authors Dr. Mohamed Galal and Dr. Khairy Elgiziry, the effect of different board characteristics on the bank risk-taking is investigated. 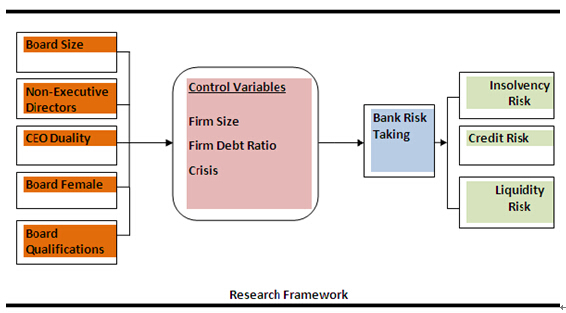 The authors used three different measures of bank risk-taking as independent variables, namely, the Z-score, the credit risk and the liquidity risk .The authors also used OLS pooled regression techniques to test for this relation. The lead author Dr. Mohamed Galal goes on to suggest that board characteristics; including board size, non-executive directors, CEO duality, and board female are significant determinants of bank risk- taking. And as expected the capital ratio is the main determinant of bank insolvency risk, accordingly increasing capital ratio will enhance the stability of banks. “The Crisis is found insignificantly related to the three risk measures which indicate that Egyptian bank's risk is not affected significantly by the financial crisis during 2008 ”,The authors said. The authors show evidence that board size is positively significant with bank risk, as large board size achieves higher insolvency risk and small board size aligns the interests between shareholders and managers resulting in a reduction of bank risks. The proportion of the non-executive directors is also negatively significant correlated with both insolvency risk and liquidity risk. CEO’s duality is found positive significantly with only credit risk, as CEO duality increases the CEO power and give him motivates to take more risks. Board female is positively significant related to Z-score indicating that more board female reduces bank insolvency risk. It is also found a positive significant relation with credit risk, while it is negative significant with liquidity risk, accordingly, more female members will decrease both insolvency risk, liquidity risk and increase credit risk. Board members with a PhD degree has positive insignificant relation with the three measures of risks, accordingly, better educated board members may decrease bank's portfolio risk. The authors also investigated how various components of the Z-score act in response to different board characteristics, and they suggested that lowering Z-score is not attributed to the decrease in ROA or the increase of the standard deviation of ROA rather than the decrease in bank capital.